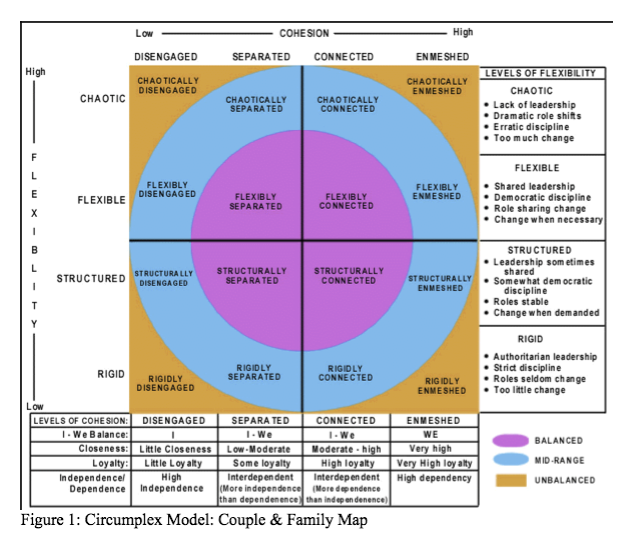 So Stephen Shimshock (whom I am cross-mentoring -- he's teaching me a lot about photography -- and who is using narrative in his work at Casey Family Programs) was telling somebody in the hallway about the confluence framework, and the guy said, "Sounds like the circumplex model." It's flipped around, but the two axes are flexibility (from rigid to chaotic) -- my hierarchy or "degree of imposed order" -- and cohesion (from disengaged to enmeshed) -- my meshwork or "degree of self-organization." Note the amazing similarity in even the word "mesh" carrying through both frameworks. Does that not look just like one of my story-event drawings? Or one of the Cynefin "dynamics" diagrams? And the circumplex model was first published in 1989. It truly amazes me that so many people could have come up with so many very similar concepts, across time and space and background and purpose and personality. And that I have been so long in finding these connections. There is quite a blossoming of wonder for me in this. I feel privileged to play a small part, a microscopic part if you think of it, in this whole big thing. Two other possible siblings at this moment are parts of Tom Graves' enterprise canvas (correction: more likely, according to Tom, his context-space mapping) and the Four-Room Apartment theory (both of which arose around the time of the circumplex model). I have been very busy with a story project the past few weeks but hope to get time to delve further into these possible connections soon. I haven't even read the whole circumplex-model paper yet, but the images in it are so exciting I just had to share them right away. If you search for the term you will find even more papers about the circumplex model and its uses. The reason I call these younger models and frameworks "siblings" is that in no way do I think they are identical. All of the siblings (and their grandmother) show strong signs of the history, background, learning style, goals and unique point of view of their creators. And, like real family members, none are any better or worse than any other, any more right or wrong, except possibly in specific contexts. And like real family members, they should all respect both family solidarity and individual gifts. 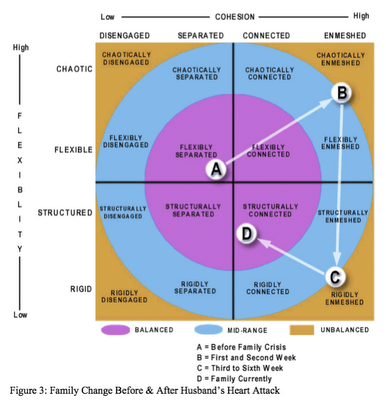 The exciting thing about being able to line all these frameworks and tools up next to each other is that this sensemaking family can create for us a sort of menu of approaches so that we can all find what we need, whenever we need it, whoever we are, however we think best, wherever we are coming from and wherever we want to go. It is of course, as I've said elsewhere, the most sophisticated use of such frameworks to be able to use all of them as our needs require it, to be comfortable with the whole family. A true master of sensemaking (if there could be such a person) would be able to visit with these and any other yet-to-be-discovered family members and learn something from each of them, and teach them each something as well. Very interesting. 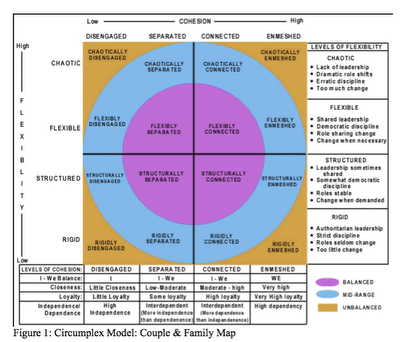 :-) Looking in more depth at the Circumplex [reminds me, someone else has used that term for another model in a related field - will try to hunt it out for you], seems to me there's an even closer parallel with the 'pyramids' of relationship on the early Cynefin diagrams. On the latter, the relationships were more in terms of hierarchy-structures, but if you flatten it out you'd end up with something very similar to what's shown here on the Circumplex. I do like your notion of 'siblings': models that are similar in nature and structure but have arrived from different directions and for different purposes. My work on context-space mapping - http://weblog.tomgraves.org/index.php/2010/07/13/csm-history/ - probably has a much better claim to be a true sibling here, or a closer cousin at least. I would probably suggest 'cousin', though, because - as the article explains - Carl Jung plays a prominent part in its family-tree. Though again, Jung's thinking was strongly influenced by mandalas and the like, which likewise have family-resemblances to the medicine-wheel. The focus of both of those tools is strategy and enterprise-architectures, but they could both be used in other fields as well. And there's another closer sibling-method in my book "Disciplines of Dowsing", co-authored with archaeographer Liz Poraj-Wilczynska - complete text at http://tetradianbooks.com/2008/09/disciplines/ , two-page method reference-sheet at http://tetradianbooks.com/2008/09/disciplines-ref/ . That's based on the somewhat Cynefin-like categorisation of Artist (Chaotic), Scientist (Complicated), Priest (Simple) and Magician [aka Technologist] (Complex) - you might find that useful, especially the descriptions of 'Seven Sins of Dubious Discipline' in the main text of the book. Thanks again, though: great post. Tom, thanks for the comment and I've updated the post to say that you think the context-space mapping is a better fit. It's just a historical accident that I've been so busy these past few weeks (with a fascinating yet confidential narrative project) that I haven't been able to give full attention to comparing your framework. It's funny you mention Jung because waaaaaay back in graduate school I made up a model of knowledge, can't even remember it now, I think it had something to do with knowing what we know and so on, and then I found out it was essentially another version of Jung's model (probably the same one you mention). At the time I was young enough to be intimidated and believe that meant I didn't know what I was doing. It's only more than twenty years later that I have the temerity to believe that maybe Jung and I (and many others) might instead have contacted the same truths without realizing it.